There is no doubt that false eyelashes go the distance to enhance eye beauty and give that eye opening finishing touch. They are truly functional in improving any natural lash length and fullness, especially in replacing lashes lost due to illness or to adding extra glamour for that Red Carpet look. Whether you want a subtle change or optimal drama, the added volume brings more openness and accent to the eye’s shape that any woman would desire, especially for weddings and special occasions. To achieve the most natural looking blend with your own lashes, you need the best quality lashes available and an equally good lash adhesive. Quality also dictates how easy or difficult the lashes will be in applying to your lash line. Two things you need to check for are appropriate length and fullness to achieve natural looking volume. Too many women make the mistake of wearing lashes that are either too long or too thick, which can make them appear ill-fitting or overdone. False lashes should always follow the line of your own lashes, and fit naturally on the lash line within the inner and outer corners of the eye. If using strip lashes always measure them to fit the width of your natural lash line first, by setting them next your lashes. Then remove and trim them where needed with sharp scissors. With half lash or clumps, size them for width at the outer corners of your upper lash line. 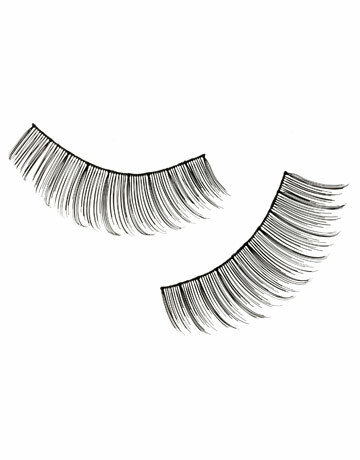 Half lash/clumps are a great way to add subtle but sophisticated glamour, especially with a winged eyeliner application. Individual lash strands or cluster flares allow you to build fullness and length into your lash line where you need it the most. There are two types of lash adhesive: a semi-permanent resin based glue, and temporary latex based adhesive. If you want to wear lashes just for a day or evening, then the latex based glue is going to be easier to wear and remove, especially if you want to save lashes and reapply them again. Resin glue is designed to allow false lashes to remain on for several days; however it will take more time and effort to remove the adhesive and lashes properly with a remover, and without damaging your own lashes. The pro trick to getting strip or half lash/clump false lashes adhered without obvious glue marks is to use the thinnest coat of lash adhesive possible. Dip a toothpick into the glue and run it along the lash strip; then wait 45 seconds for the glue to begin to set up before applying the strip. With the individual lashes or cluster flares dip the end into the glue on the toothpick. Apply the strip or individuals next to the root area of the lash line, as close as possible. Following these methods will eliminate unsightly glue clumping, and give false lashes a stronger hold to your own when applying to the lash line. Some artists recommend curling the natural lashes before applying the false ones or applying a coat of mascara before applying lashes and it’s a matter of personal choice. However if your natural lashes are stick-straight I f ind that curling them first with a heated lash curler, and then immediately applying a very thin coat of water-proof mascara, helps to hold the curl. This method gives more natural lash continuity in which to situate the false lashes for the most natural results. Once the lashes are in place, I like to apply a very thin coat of eyelash primer to help the real and false lashes blend together. It gives further shape and definition, and to make them look more like natural growth from the lashline. To finish and “place” the lashes I paint on the mascara with a mascara fan brush, (or you can use a disposable wand) and just enough to cover the primer’s white tint while adding a bit more definition. It’s important not to overdo the mascara application with false lashes, and keeping good separation, or you risk having a clumpy unnatural appearance. Once the mascara is set, use a clean mascara wand or eyelash comb to separate lashes and eliminate any little mascara globs or clumps. Don’t forget the lower lashes; they will need a coat of mascara to balance out the overall look. If they are skimpy on volume or length, then it’s a good idea to use the lash primer on them under the mascara to bring out more fullness and depth. You can also opt to use individual false under lashes to do the same thing. Lastly, practice applying and wearing lashes before you do them for your big event, so that you get the best results possible.